Your Wedding Scentscape: 7 top tips to a planning a memory-making wedding. but for you and your guests for the rest of your lives. Think Scent + Scape (as in Land + Scape). The scent scape is an environment redolent with fragrances. At a wedding this will include the natural smells of the environment, your wedding flowers, the personal fragrance chosen by each of you, and the aromas of food and wine. When you're planning your wedding, you're planning a day that moves from ceremony to party. What scents will match up with each stage of the experience? Zingy, interesting fragrances work well with the reception/party half of the day, but you might want to choose something more symbolic, something softer, for the ceremony. And don't forget lobbies and entrance halls. Walking through a more highly scented entrance before entering a space where the fragrance is more subtle is a great way to signal a change of pace. A good preliminary step is for both of you to write a list of scents/smells that you really like (and any that trigger bad or unhappy memories), to use as a guide. 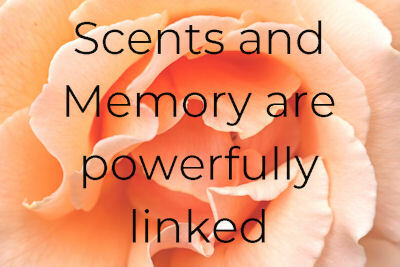 Including a smell you associate with a loved one who is no longer with us can be a lovely, and private way of evoking their presence on you special day. Including a smell you associate with your first date, or the proposal, can add to the romance of the day. Bridal bouquets were originally all about fragrance - the fragrance needed to mask unwashed bodies! So they were highly scented. While your bouquet and buttonholes or pocket posies no longer need to mask other smells, fragrance serves a powerful purpose. When talking with your florist about the flowers in the bouquets and buttonholes, talking about your preferred fragrances can help narrow down your floral choices - and can also be a great help in sticking to what is local and what is in season (both ways of keeping costs down). Unfortunately, many rose varieties, for example, bred to be long-lasting in a vase, have sacrificed perfume. Talking fragrances can help you have the flowers you like the look of, together with a subtle fragrance that will not only bring back great memories, it will be a calming influence on the day. As the marrying couple, you are going to be side by side throughout your wedding, so make sure your signature fragrances complement one another. I'm told by fragrance experts that, while fragrance choice is a personal thing, brides are most likely to opt for floral scents, while grooms will tend to choose fresh ones. Generally speaking, these won't clash, but best to check - and not just by smelling what's in the bottle. Fragrances react with your personal body chemistry, so what smells great in the bottle can smell quite different on your body. And definitely coordinate bouquet, buttonholes, and signature fragrances. You're going for layering, not the wars of the noses. Even the most beautiful scent can become overpowering. I remember when I was at university, living in college, one of my friends received 144 red roses from the guy she was dating. In a small college room, the scent was unbearable, so they were put out in the corridor and spread around the college to reduce their impact! Advice to use room sprays and scented candles at the reception is common. But when you've taken care to choose a delicious menu, and the chefs have gone all out to produce a beautiful meal, you want your guests to savour the aroma of the food and the wine. So minimise the use of scented candles, for example. Add fresh rosemary to the rose petals scattered on the aisle, include rosemary in your bouquet, the buttonholes, or a pocket posy for your groom. Rosemary is a traditional wedding herb signifying happy memories, loyalty, and faithfulness. Elizabethan brides carried rosemary to ensure faithfulness and keep their spouses from “forgetting” they were married! Rosemary is cheap and easy to work into table centrepieces, or to create lavish garlands. Don't go past mint - in Ancient Greece, Athenians wove mint and marigolds, which they believed to be aphrodisiacs, into bridal garlands and wreaths, mint features in quite a few cocktails, and on dinner plates with everything from lamb to salads. Orange blossom is the traditional bridal scent - from the days when brides wore wreaths of orange blossom as an emblem of innocence and chastity. But also, because the orange is one of the few plants that blooms and bears fruit at the same time, as a promise of future fertility. Citrus scents in general are fresh, and complement, rather than clash with floral scents and the aromas of food. The possibilities are endless. Freshly starched and ironed linen has its own subtle scent, that speaks of luxury and fine dining. But you can also lightly spritz a linen spray on tablecloths and napkins to link with your overall scentscape.